No, I’m not at London fashion week (if only). I’m researching a response to the question: “does the training really have to be for two whole days?”. The short answer is: “Yes”. The slightly longer answer is: “Yes, if you want people to be able to do something differently when you get back to the office”. This blog is the first of possibly many attempting to answer the question more fully – using educational models. 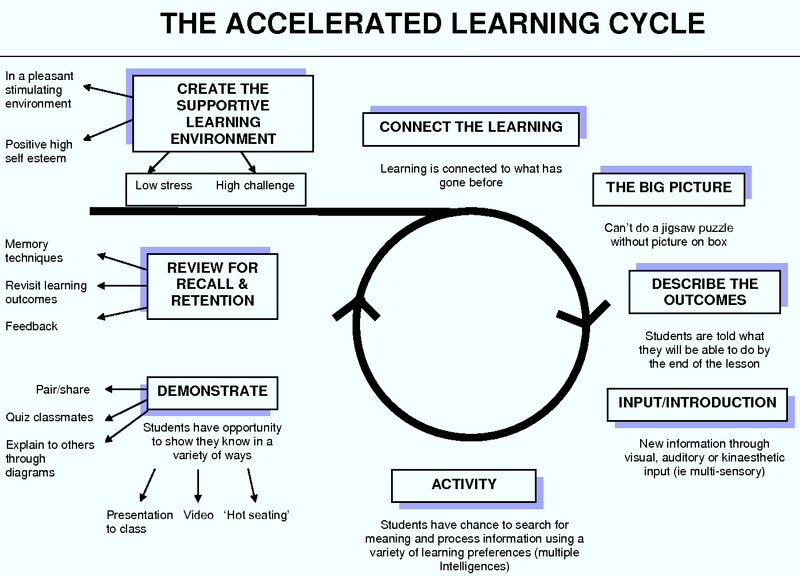 The first educational model I came across was the accelerated learning cycle. I was (and still am) deeply interested in making the learning experience fun and easy. And effective. And traditional learning models were not cutting it. I wanted people to leave my training feeling like they had not only learnt new things that had a direct application into their work, but that they were already able to carry out the new skills or behaviours confidently and immediately. And that takes time. And a variety of ways to interact with the same material. The accelerated learning model shows us how learners need to cycle through the information and visit the material in many different ways. I first came across this model twenty-mumble years ago and it still represents how I structure my training today. It showed me that simply being exposed to information is not learning – but give people a stimulating and supportive environment where the learning is connected to what they already know (adult learning theory*); help them understand the where it fits into their world; let them know why it’s useful and what they’ll be able to do at the end. They need to receive the new information through multiple senses and get the opportunity to work with the data in a number of ways. The more complex the data or the less experience with it, the greater the number of ways and time we need to interact with it (spiral learning*). This entry was posted in Training for Trainers. Bookmark the permalink.